The Eugene O’Neill Theater Center in Waterford, Connecticut, the beloved and renowned “Launchpad of the American Theater,” has connected theater makers with their contemporaries for generations since its founding in 1964. I count myself among the innumerable up and comers who have had their eyes opened to new theatrical worlds through time spent at the O’Neill. Which brings me to James Godwin. I first saw Godwin perform last summer during the National Puppetry Conference (currently celebrating its 25th anniversary at the O’Neill), and I was taken with his quick wit and wry sense of humor. Naturally, when I was invited to his one-man show, The Flatiron Hex, at Dixon Place last month, I snatched up a ticket. This ambitious show is set in an alternate New York called NYORG — a city in the middle of a swamp. NYORG is perhaps a future version, perhaps a parallel reality, in which technology and shamanism have gained prominence in all forms of human relationships and social structures. According to Godwin, “My ideal of what the show is, is not a future New York, but just a step off of what could have happened differently in the 80s, if the biotech people had more power than the silicon people.” There, Wylie Walker (our everyman hero) is tasked with saving the city by healing a robot named Sam who controls the operation of the Flatiron Building, so that they can ward off a devastating storm that is headed towards the city. The image that inspired The Flatiron Hex was the Flatiron Building, which Godwin has always loved. From there, he spoke with Tom Burnett, his co-writer, director, and sound designer, to craft a show that “would play out in surprising and weird ways,” and that he could perform solo. Hurricane Sandy inspired the impending storm barreling down on the city, and Godwin and Burnett decided to tell the story in a noir style, using a Richard Poorman-esque voiceover to draw the audience in and help them connect to the story’s many moving parts. The voiceover was both a technical necessity, helping to cover for Godwin while he transitioned props and puppets on stage, and an allusion to the omniscient narrator in comic books, revealing things that were not seen on stage. Godwin cites Paul Zaloom and Bill Irwin as two of his biggest performer inspirations. The story developed from a cross pollination of Godwin’s favorite “weird fiction” sources, including spores infecting your brain from Grant Morrison’s “The Invisibles” comic book and the idea of a conjoined couple from the Panda Joined project. In addition, the Stephenson images came from quantum computing in the work of William Gibson, Neil Stevenson, and Margaret Atwood. Wylie Walker’s name is a combination of Riddley Walker by Russell Hoban, a 1985 dystopian novel, and a transactional therapist named Wylie whom Godwin met while apartment hunting years ago. Godwin was surprised by how much people recognized these fictional ideas and inspirations. He says, “Weather control, conspiracy theories, and shamanism are all kind of in the zeitgeist now, and that I find really exciting.” During his first workshop performance at the Henson Carriage House last October and this series of six readings at Dixon Place, he was listening to the audience’s reaction to help him strike the balance between intriguingly weird and inaccessible. Encouragingly, in conversations after the show, the audience was pushing him to dig further into the weirdness of the piece. Running about an hour and twenty-five minutes (or, “the lifespan of a human bladder,”) the piece is a marathon for Godwin as he flies around the stage. When rehearsing the show, he used a friend’s space in Williamsburg, Standard Toykraft, and made notecards of every puppet and hand prop that he needed to track, so he could work out his traffic pattern. Godwin says, “That’s where you discover you can’t do three characters at the same time.” (Although sometimes there were at least three characters performing at the same time, between video projections, voice over, Godwin himself, and the puppets he was animating.) Pre-set for the show is an hour and a half, which gives an idea of the level of puppeteering acrobatics Godwin performs during the show. Although Godwin insists he is not message driven, this glimpse into his imagination certainly forces audiences to reconsider our present relationship with technology and what our city will look like in the not so distant future. 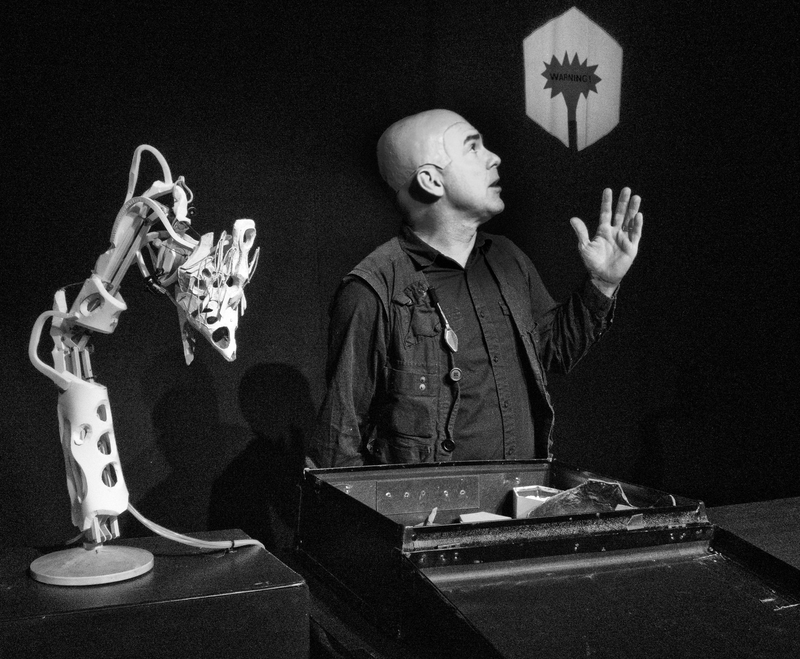 Of all the technological innovations Godwin included in the show, his favorite brainchild is the idea of shamanic technology married with technology where people can interact remotely. That, and the SIM Box, a spinoff of Facebook where you can capture your essence in virtual form before you die, enabling conversations with your loved ones even after your body has died. Not too far fetched, considering there is already technology that responds to neuro-impulses. After attending this year’s National Puppetry Conference at the O’Neill, Godwin hopes to find a venue for The Flatiron Hex in New York, then raise funds to increase the production values and buy himself some more rehearsal time. Stay tuned for future iterations of this show, coming to a future New York, or maybe even NYORG, near you.